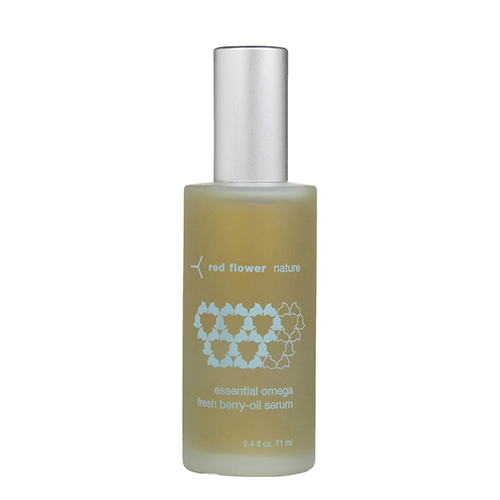 Red Flower's Essential Omega Fresh Berry Body Serum features supreme antioxidant and phytonutrient dense strawberry and blueberry extracts that give skin a decadent and protected feel, while retaining the appearance of natural moisture. Juniper Berry essential oils combat the look of cellulite + eczema, while ellagic acid in the berry oils bestow the look of natural vibrance and healthy radiance. The herbal scent of lavender, rosemary and mint lends a bright and up-lifting sensation. Apply 2-3 pumps to fingertips and massage into skin from toes to shoulders. Apply twice daily to arms, hands, feet, décolleté – and anywhere you would like to diminish the appearance of sun damage. For an enhanced daily ritual apply in circular motions, massaging for up to two minutes, and layer with Red Flower's Arctic Berry Cloud Cream to provide a feeling of deep moisture and protection.